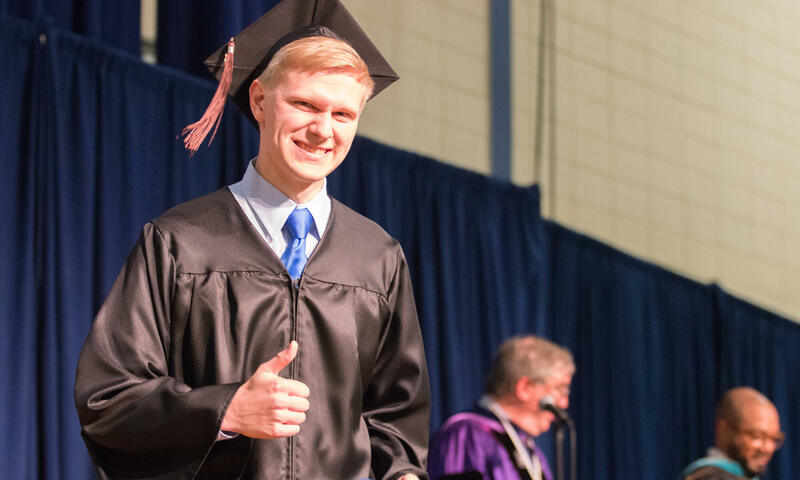 Concordia University Wisconsin will award an honorary doctorate to a World War II Navy veteran during fall commencement exercises for 506 students on Saturday, Dec. 15. In addition to undergraduate and graduate students receiving degrees, Walter William Raebel, 90, will be presented with an honorary doctorate of laws. Raebel, who resides in Cedarburg, Wisconsin, enlisted in 1945 following his graduation from Lutheran High School in Milwaukee when he realized his draft number would definitely be called. After returning from three years of active duty, he attended UW-Madison and was only six credits shy of graduating when his father passed away and he needed to leave during first semester exams to support his family. “Walt epitomizes someone who views learning as a lifetime process,” noted Eduardo Garza, Concordia’s executive director of community engagement and veteran services. “It doesn’t matter how old you are,” said Raebel. “Veterans now more than ever have great opportunities to pursue a college degree. They can follow their dreams and make something happen for their family.” Raebel will do just that when he becomes the first member of his family to earn a college degree. Live stream: Click here to watch Saturday’s commencement via live stream. Concordia will honor two teachers that day with Master Educator Awards, recognizing their dedication, excellence and a love for learning in LCMS education. Joy Yurk, a seventh grade teacher at St. Paul Lutheran School in Grafton, Wisconsin, will receive the elementary/middle school level award. Sarah Crowder, a middle and high school theology teacher at Faith Lutheran School in Las Vegas, Nevada, will be presented the same award for secondary education. Yurk and Crowder are Concordia University Wisconsin alumnae, having graduated in 1990 and 2000, respectively. Yurk credits the late Rev. Wayne Rasmussen, a longtime CUW professor and beloved men’s basketball coach, with instilling in her that teachers do not simply teach material, they teach and reach kids. She views education as a lifetime learning process and has gone on to earn a master’s degree in language in literacy. Crowder was extremely active in theater arts as a student, and she indicated her experiences with developing Concordia’s Haven for students have aided her with Faith Lutheran chapel services. She is pursuing a master’s degree in theology. Of the 506 graduate candidates, one will receive a doctorate in pharmacy, while 269 are earning master’s degrees. There are 230 students earning either a Bachelor of Arts or Bachelor of Science degree. Six will receive a two-year associate degree. Graduation ceremonies begin at 1:30 p.m. in the R. John Buuck Field House on campus, 12800 North Lake Shore Drive. Dr. Thomas Cedel, president emeritus of Concordia University Texas in Austin, will be the commencement speaker. Elizabeth Ekblad, a Classical Education major from Sheboygan, Wisconsin, will deliver the student commencement address. A baccalaureate service in The Chapel of The Christ Triumphant will be held at 10 a.m. that morning. The Rev. Dr. Nathan Meador, senior pastor at St. John Lutheran Church in Plymouth, Wisconsin, will be the speaker. Megan Klompenhouwer, an Elementary Christian Education major from Sheboygan, Wisconsin, is receiving The Marsha Konz Student Educator Award for superior achievement in the field of teacher education. Justine Haima, a Literacy major from Hartland, Wisconsin, is being honored with The Marsha Konz Graduate Educator Award for outstanding performance by an educator pursuing graduate studies.